View our Bird Control FAQ Page to get answers to common questions about protecting your facility from pigeons and other pest birds. 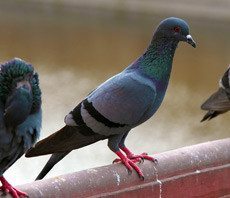 Pigeons, Canada geese, sparrows, and seagulls are considered nuisance birds and are becoming a major problem for businesses and commercial facilities. Not only do these birds and others cause serious health problems for both your employees and customers, they can decrease the value of your property, create costly repairs and tarnish your company’s image and reputation. At Wil-Kil, we understand how destructive nuisance bird infestations can be to your company’s profits and bottom line so we offer nuisance bird control as a special service in conjunction with our ongoing IPM programs. Pest birds create havoc by nesting and roosting on buildings, defacing walls with their droppings and by contaminating products. Wil-Kil offers bird control solutions to keep these pests at bay. At Wil-Kil, it is our goal to find an effective program to resolve all of your company’s wild bird issues. We’ll conduct an onsite survey to professionally evaluate your bird control needs. Contact us today and find satisfaction and peace of mind with Wil-Kil Pest Control. Pest-Proof Your Business Before Winter Strikes! Have you ever been walking up the sidewalk to a business establishment only to see that unsightly view of bird droppings covering the area all around the building? You automatically look up—just in time to see the fly by shooting of a bird bomb splat right in front of you. Suddenly, your desire to do business has waned as you carefully step around the bird droppings in your retreat. Warehouse pest control is a rigorous and ongoing process, especially in warehouses that contain sensitive materials such as food and beverage. Here are some pests most common in warehouses, some tips on how to exclude them, and where a professional pest control company can help.